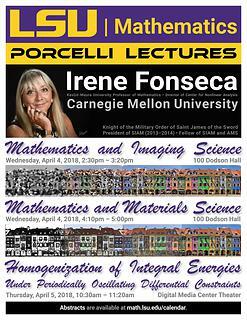 Professor Irene Fonseca (Carnegie Mellon) will deliver the 2018 Porcelli Lectures. Irene Fonseca is the Kavčić-Moura University Professor of Mathematics and the Director of the Center for Nonlinear Analysis at Carnegie Mellon University. This lecture will be accessible to a general audience, including high school students. Abstracts and more information are available on the departmental calendar.